But is it really that sad? Friendships are constantly evolving, new ones starting and old ones ending and that's just how it is. Last week I read this post on friendships by Megan Lillie over at Thumbelina Lillie and it's a post where I was like "that's totally how I'm feeling!" so thought I would share a little bit about how I've been feeling recently. Throughout primary and secondary school I always had a close knit friendship group - and that was great back then, knowing you could always rely on someone being there and also who to go to for the best advice on this and that. But since we all left for university, college and new jobs, that friendship group has all but gone. You might wonder how strong it was in the first place, but I think it's more that people move on, start a new life, become busy and make new friends - which is totally understandable and expected. What I didn't expect was to see one of my closest friends turn our relationship into a toxic mess. In short, an event happened and I was there for her without any questions asked or doubt. Then it got thrown back in my face and I was upset, annoyed and shocked for a while - to the point where I would have dreams about it and couldn't sleep with worry. But it opened my eyes to the kind of one-way and selfish relationship it was in the first place. I've learnt that even if some of my friends live down the road or across the world (current situation with one) that I can rely on them, just as much as they can rely on me. It's a two way thing, built on similarities, trust and love for one another. And it turns out your sister is pretty good at being a best friend and an annoying sibling too! 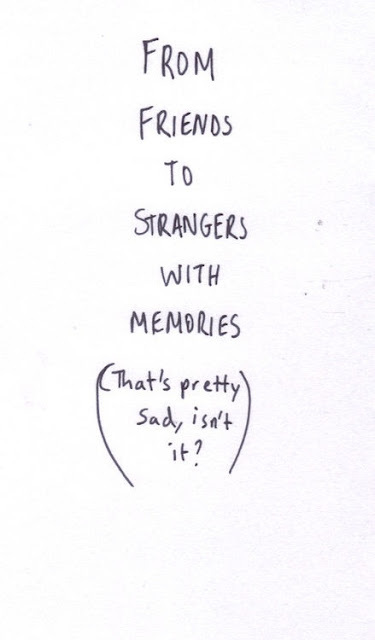 What I want to say is that sometimes friendships do drift apart and that's okay because it's just life. Some will be there in the beginning and others will be there at the end, but that doesn't make either one anymore meaningful to you. Let me know what your thoughts are below! Are you going through a tricky friendship situation too?